You are here: Home i In Focus i In focus 2018 i Diversity in the labour market – focus on newly arrived women i Newly arrived immigrant women – more than a labour market project? 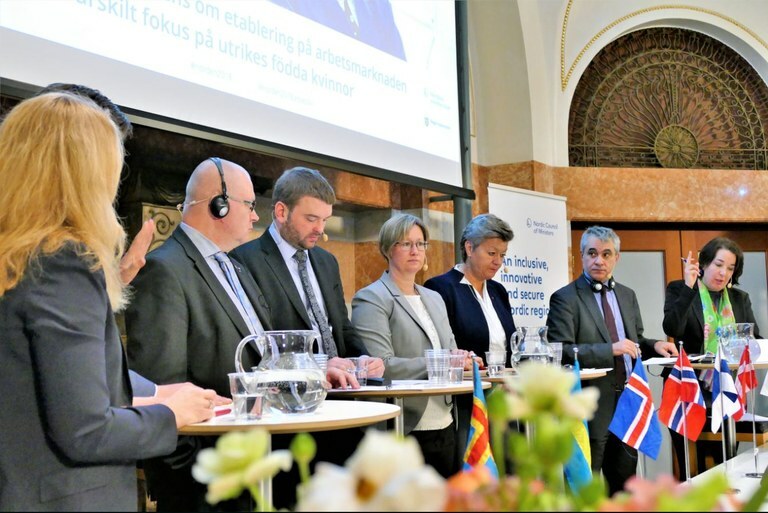 “Statistics show that foreign-born newly arrived women face considerable difficulties accessing the labour market, more than other groups,” said Sweden’s Minister for Employment Ylva Johansson as she opened a Nordic conference on labour market integration with a special focus on women in Stockholm on 13 April. A full day was used to discuss the differences between the Nordic countries when welcoming newly arrived women; which measures work and how civil society contributes to the integration process. A still to be published OECD report which sums up the challenges was debated by the labour ministers. From left: Anniken Hauglie, Norway; Jari Lindström, Finland; Ásmundur Einar Daðason, Iceland; Camilla Gunell, Åland; Ylva Johansson, Sweden and Stefano Scarpetta, OECD. The moderator Sharon Jåma Hofvander is to the right. “The OECD’s statistics for Denmark would look different if they had been able to include the latest figures. The proportion of refugees entering the labour market has risen from 20 percent in 2015 to 38 percent in Q4 of 2017,” he pointed out. Parallel with the conference, the Council of Ministers has also prepared a policy brief for what works and what does not when it comes to labour market integration in the Nordic region. One policy difference is whether refugees’ competencies are improved before they face the labour market – train-and-place – or whether training best happens in the workplace – place-and-train. In Finland the former dominates, in Denmark it is the latter. “In Norway we have now gone for a different solution by moving integration issues to the Ministry of Education and Research. Many immigrant women not only have low competencies, they have none at all. So the answer is education, education, education,” said Norway’s Minister of Labour, Anniken Hauglie. The Danish policy of wage subsidies and language training in the workplace has worked well – in Denmark. The time refugees remain unemployed has been cut on average by between three to 15 months. Similar results are not found in Norway and Finland. Conversations and guidance about work has a positive effect in Finland, Sweden and Denmark, but it is a relatively small one. In Sweden 5.8 percent more found work compared to those who had not had access to such conversations. Several ministers also underlined the importance of outreach programmes for women who ‘missed the train’ the first time, and for preventing that women stay at home with children for 20 years, not accessing the labour market. The conference also heard about several projects aimed at immigrant women, including project Mirjam, which the Nordic Labour Journal writes about here. “Project Mirjam uses conversations and group discussions with advisors from the Employment Service, and study visits to different workplaces. We try to expand the view of where women can work,” said Magdalena Gustavsson. “One of the occupations we looked at was excavator operator. The fact that women can have that as a job appeared very strange to us,” explained Nagham Sannoufi, one of the project Mirjam participants. Since many of the women arrive with small children, or give birth during their first years after arriving, it is important to have measures that reach this group too. “Language is so incredibly important to build trust. As a parent I have to be able to make sure my children are happy in their preschool. If I feel I cannot communicate well with the preschool staff, my bar for wanting to use child care services will be set very high,” said Anna-Karin Gustafsson, an analyst at Oxford Research. She has carried out a comparative study of newly arrived women’s integration into the labour market in the Nordic region (read the NLJ’s interview with her here). In Norway, immigrant children are offered 20 hours of preschool a week for free, and Stockholm runs a project with special integration preschools. But certain measures also risk locking immigrant women in. The childcare allowance, given to families that choose to stay at home to look after children, has now been abandoned in Sweden, but is still common in Finland where 90 percent of all families use it at some stage. 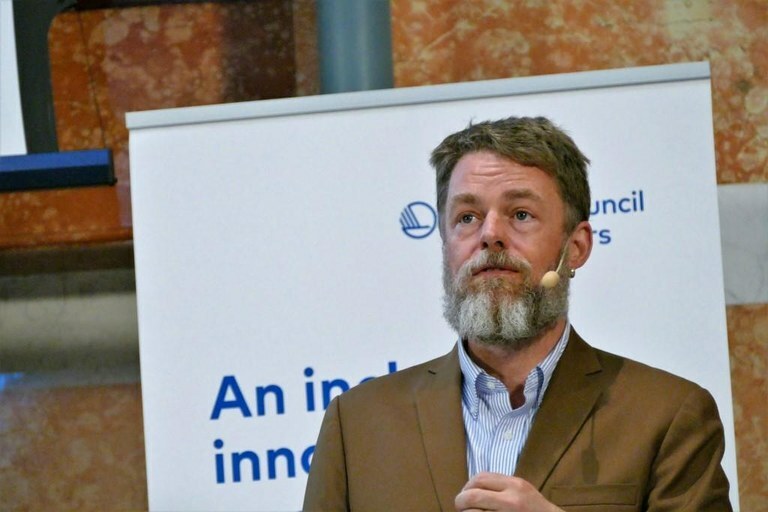 Municipalities and civil society play a major role in the integration process across the Nordic region. When 160,000 refugees arrived in Sweden over just a few months in 2015, the Studieförbunden, the umbrella organisation for Swedish non-formal adult education, immediately stepped up to the challenge. The state offered adult education for asylum seekers. Since 2015, 120,000 people have attended the courses ‘Swedish from day 1’ and ‘Everyday Swedish’. This year, Sweden will invest 40 million kronor (€3.3m) in adult education outreach projects. A further 50 (€4.8m) will be allocated each year for two years after that. “It is important to include the whole person in society. This is not only about accommodation and work,” pointed out David Samuelsson, Secretary General for the Studieförbunden later in the day. It is also important to be flexible. “Immigrant women come from a patriarchal culture where it is not always possible for them to participate in courses for both men and women. That is why we have organised courses for women participants only, with female course leaders,” said David Samuelson. Women refugees do not represent a homogenous group, pointed out Hjördis Rut Sigurjónsdóttir and Mari Wøien, who have been studying two projects at opposite ends of the scale: Korta vägen (Short cut) targets immigrant women with higher education, and aims to speed up the process of upgrading their competencies, and BaZar, which aims to give immigrant women enough Swedish language skills to be able to shop, communicate with a preschool and master other everyday tasks. A relatively large number of the Syrian refugees who arrived in Sweden in 2015 were teachers. Korta vägen provides an intensive course in Swedish targeted at this group. 764 foreign teachers have taken part. “Both projects were successful. 70 percent of the women who participated in Korta vägen found work,” said Hjördis Rut Sigurjónsdóttir. “Women participating in BaZar got language skills which gave their self-confidence a real boost,” said Mari Wøien. 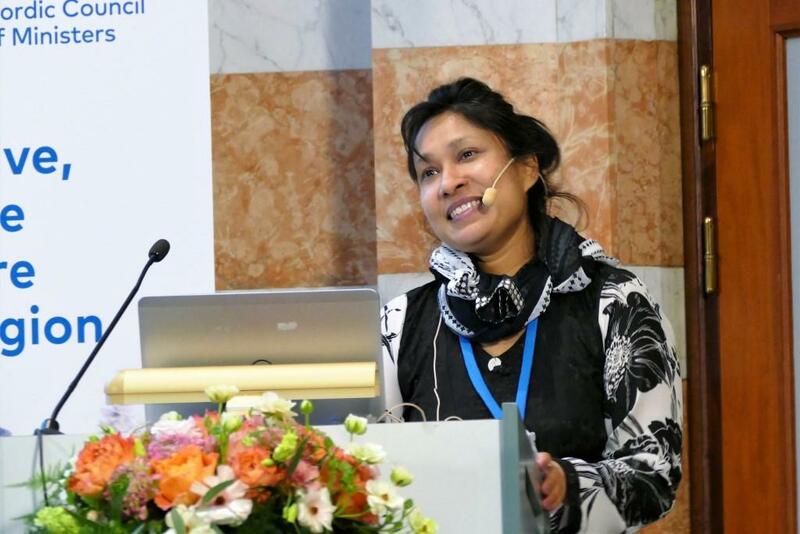 Nafisa Yeasmin from the University of Lapland presented her list of the ten biggest obstacles facing newly arrived women who want to access the labour market. In her home city of Rovaniemi there are still employers who are not used to immigrants and fail to call them in for job interviews, she said. “The problem is not that the immigrant women are unemployed, but that the job they get does not fit with their qualifications. In one of our surveys, 30 percent of the immigrant women said their jobs did not correlate with their backgrounds. Only eight percent of Icelandic women said the same. “As they are not registered as unemployed, nobody is helping them. They also often have low self-confidence, and are far more critical to their own language skills than male immigrants – despite the fact that their skills are often better,” said Marcus Meckl. 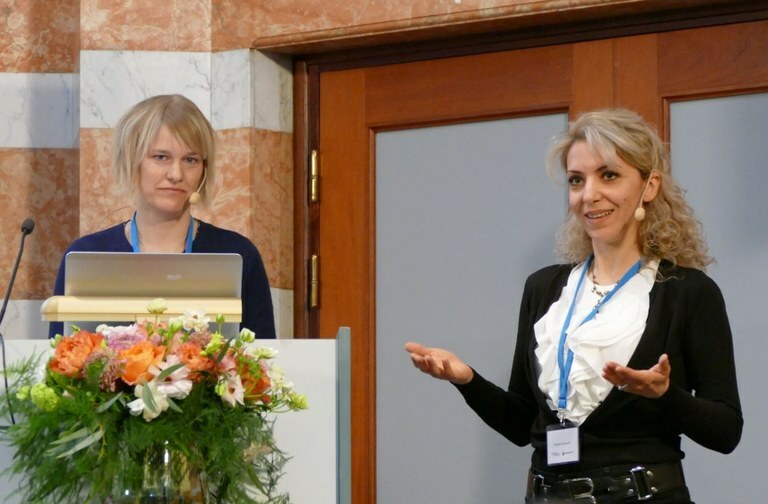 Magdalena Gustavsson, head of equality at the Swedish Public Employment Service, and Nagham Sannoufi, a participant in project Mirjam.